"This is not your usual mustard mayo potato salad. These potatoes are slathered in a rich ranch dressing and bacon pieces. 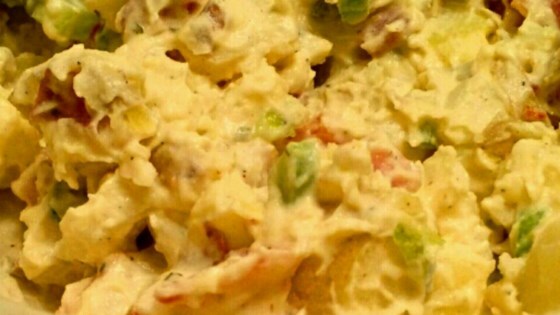 My family and friends love this potato salad! It is requested at every cook-out." Bring a large pot of lightly salted water to a boil. Add whole potatoes, and cook until tender, 15 to 20 minutes. Drain, run under cold water to cool, and chop into 1 inch cubes. Transfer to a large serving bowl, and refrigerate until completely chilled, about 2 hours. In a small bowl, stir together the ranch dressing mix, mayonnaise and green onion. Cover, and refrigerate for about 2 hours to blend flavors. Wrap bacon in paper towels and place on a plate. Cook in the microwave until crisp, about 15 minutes depending on the power of your microwave. Cool. Stir the mayonnaise mixture into the bowl of potatoes. Crumble bacon into the bowl, and stir to distribute. Serve. The tangy-style of German potato salad you love! Wonderful and so easy! This was a big hit! I also followed the others and used sour cream AND mayo. I'll be making this one again very soon. Thanks for the great recipe! Excellent! Delicious precisely because it isn't bogged down with 40 different ingredients, although I did as other reviewers suggested and used 1C mayo and 1C sour cream. Highly recommended.